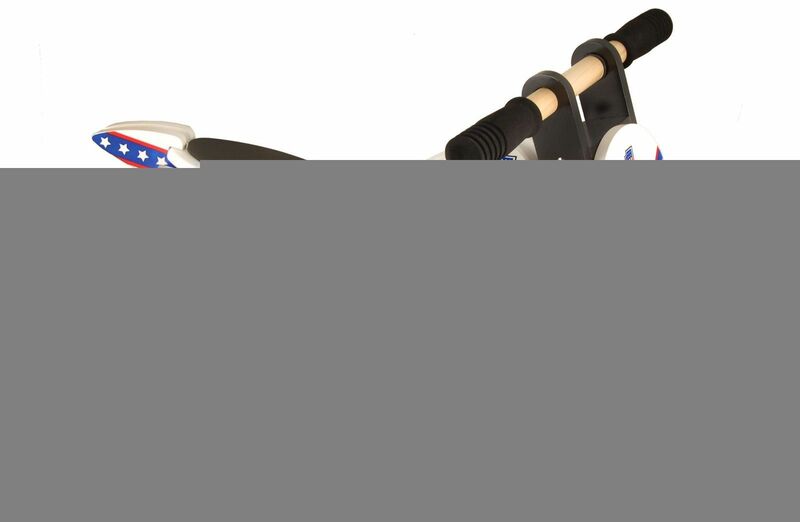 This wooden balance bike is designed around real big engine sports motorbikes. The Heroes range of scramblers gives your toddler the thrill of emulating their favourite racing bike rider. Evel Knievel was an American daredevil who attempted many dangerous stunts over his career. Knievel's televised motorcycle jumps turned him into a celebrity. He wore a v-shaped Stars and Stripes outfit which we've replicated on this stylish bike. Scramblers are designed around off-road motocross motorcycles, with design features found on the real thing and knobbly tyres for some off-road action. Keep your child protected on their balance bike with Kiddimoto children's bike helmets and children's bike gloves. Pay instantly with your debit or credit card telephone 01633 816080 or click on PayPal at checkout.